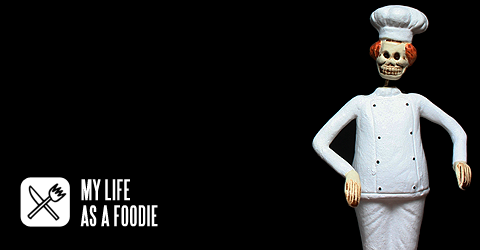 Introducing “Dude Food” – a new video series from My Life as a Foodie and Zeroface Project designed to teach men (and women) how easy it is to cook the things men (and women) love to eat. The recipes are simple and approachable, and the pay off is enormous. In our first episode, we’re making the king of snacks – beef jerky. Because nothing goes better with beer than beef jerky, it’s the most important snack food you need to learn to make. Ingredients are simple (lean beef, salt, pepper, liquid smoke), preparation is a breeze (slice the beef, season it, place it in a dehydrator), and the equipment necessary (sharp knife, cutting board, container, $30 dehydrator from Target) is very accessible. Freeze meat until firm, but not completely frozen. Remove from freezer and, on a clean cutting board, slice the roast into 1/8″ slices. Place the sliced beef in a container, one layer at a time, salting each piece generously, then seasoning with cracked black pepper. If using liquid smoke, add 1 to 3 drops to every other layer. This stuff is not a marinade or seasoning. It’s like aroma-therapy for meat. You add a couple of drops to every third layer of sliced jerky. While the meat is curing for 48 hours, the liquid smoke permeates the entire batch, so you’ll get an essence of smoke throughout. Use too much, however, and you’ll be eating dried campfire sticks instead of beef jerky. So go easy, cowboy. Once all of the meat has been sliced, layered, seasoned, and granted a splash or two of (optional) liquid smoke, cover and refrigerate for 48 hours. I like to turn the container over after 24 hours, but you don’t have to do that. But if you want to be cool like me, turn that container the following day. When you’re ready to start drying your jerky, take the container of cured meat out of the refrigerator, allow to come to room temperature (3-4 hours), then start laying the meat on dehydrator racks, or (if using an oven) on the racks in your oven. If you decide to use the oven, remember to lay down a few sheets of aluminum foil along the bottom to collect any drips coming off the meat as it dries. Your wife will thank me later. Remember to keep the meat from touching. Although the meat will dry considerably, you don’t want any pieces to touch, or you’ll end up with undried areas. If using an oven to dry your jerky, set to the lowest possible setting, and leave the oven door cracked a little to allow air to escape. If using a dehydrator, simply cover and plug it in. If you’re using an off-set smoker (and God help us, haven’t used any liquid smoke) make sure the meat is at least 18 inches away from the heat source, and keep a consistent low fire fed with fresh wood every 30 minutes or so. If using a dehydrator, start checking your jerky (bottom racks first) after 5 hours. If you’re using the oven, after 3 hours. If you’re using an off-set smoker, after 4. When your jerky is dry to the touch, semi-pliable, and does not appear to be partially cooked in any areas, it’s finished. It’s OK if you dry the jerky out beyond this point, but it’s best when it has a bit of a soft bite. This recipe is very basic. Feel free to embellish as you wish. You can marinate the meat with various spices and sauces (worcestershire, teriyaki, honey, hot peppers, etc.). It’s open season on beef, so go nuts! I’m back from a very relaxing vacation in Hawaii. The trip, as I expected, gave me perspective, but brought many more questions. I questioned the reasoning behind a lot of Hawaii’s food going in. And after a week of deep inquisition, I’m no closer to having a clue than I was before I got there. So much for investigative reporting. Hawaii’s a tough nut to crack – and I’m not talking about the Macadamia, which apparently plays a major part of a very famous mango-glazed chicken dip with toast points. Please, don’t ask. The food of Hawaii is schizophrenic – no question about it. • High five to Rachael Ray! Yes, that’s right – it’s raining pink elephants. 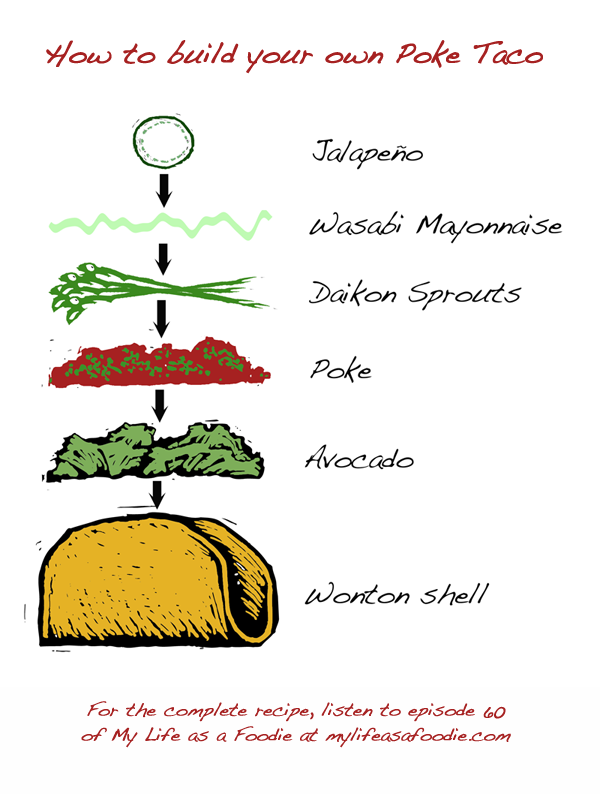 • Let’s make Poke Tacos! Music in this episode by Blue Stahli. Buy the song in the iTunes Store or from the band’s web store.